In the past 50 years, Baduk has spread to the world beyond East Asia and is now enjoyed in Europe, America, Oceania and even Africa. People speaking different languages can communicate with each other through this game. Even though the sets of rules used around the world are not exactly the same, the differences between the rules are not very significant. Even if two players play following two different sets of rules, the game will end without any problems if there is agreement about a few minor points. The minor differences in rules lie mainly in the counting. There are two big branches of counting rules: Area Counting and Territory Counting. The one used in Korea, Japan and the countries affected by Japanese Baduk is Territory Counting, and so it is also what I have been using in this series. Area Counting is used in China and the countries affected by Chinese Baduk. Since you are already familiar with Territory Counting, let me introduce you to Area Counting. In Area Counting, the meaningful points include not only the empty intersections surrounded by the player’s stones as in Territory Counting, but also the stones that surround them. This is because in China, Baduk was (and is) considered a game in which the player who has more stones on the board at the end of a game is the winner, and the empty intersections are regarded as where the player who surrounds them can put his stones at the end. Let’s look at an example. So, White wins by 3 points. So, again, White wins by 3 points. It may seem somewhat magical that we get the same result regardless of what rules we use. However, if you consider the fact that in Baduk, players put stones on the board in turn and stones on the board are counted in Area Counting while dead stones are counted in Territory Counting, you will easily solve the mystery. 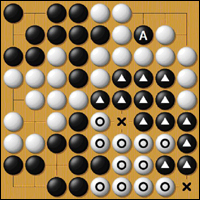 Because it is quite bothersome to count all the stones and intersection on the board, the Chinese devised a variation. They perceived that under Area Counting, the player who gets more than half of the points on a board, namely more than 180.5 points with the normal size board, wins. The Chinese method uses this half point as a standard of comparison. Once again, see Dia.1. Since we have a 9 x 9 board, half of 81 points is 40.5. Then, we take only White or Black and count what he has under Area counting. For White, he has 42 points as seen before, so we compare this number with 40.5 and the difference between these two numbers is +1.5. Finally, we double the difference, which is 1.5 x 2 = 3, the same result we got before. You will get the same result if you take Black. Please verify this yourself.